There is a point where size and weight convert what is presented as a ‘laptop’ into an uncarriable object. Call it a desktop, a brick, wheelbarrow-fodder. 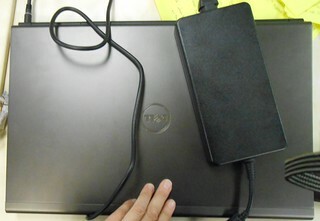 With this ‘laptop’ Dell have crossed the line to deceptive advertising. Even with two unbroken arms and a reinforced wheely-bag, this laptop stretches the notion of ‘portable’. Shame on you Dell for selling this to corporates as a portable computer. Even the charger is heavier than a combination of my 2 phones and surface with their 3 chargers with accessories. It’s laughable, literally. People laugh when they see me pull this out of my bag. Around the office I’ve reverted to using a paper notebook. Yes, reverted to paper, me! It’s almost unthinkable, but Dell managed to push me to be more inefficient by publicising thier brick as a laptop. Who’s lap? A giants lap? Can Dell be sued under the UK ‘trades descriptions act’? I definitely feel deceived. But then I’m just a foolish user, right? That kind of attitude will loose Dell the custom of boring, established, conglomerates. My work group have already managed to persuade IT to support us using Apples (Obviously I didn’t influence the replacement choice, but I did yell about the current choice). Dell, you messed up on a reliable, bulk-purchase, customer. Once one department have IT support for Apples the precedent is set… …more changes will come…. This scribble was published on Thursday, September 19th, 2013. You can follow any banter on this scribble with the RSS 2.0 feed. You can share your inspired musings after typing the anti spam word near the bottom of the page. But no Pinging because its too naughty. Re-issue, love that idea. This monster is also wider than me. Blame your IT department for ordering 17″ laptops! Dell will happily sell you 12″, 14″ or 15″ laptops. Most likely your IT department standardised on a size appropriate for staff who don’t really go on the road much, so they can apply a standard corporate image on all laptops, rather than customizing depending on what the user needs. That means they’ve just made life more painful for themselves by having to support Apple gear brought in by other types of user. Funny – I’d be delighted with a 17″ laptop; one of my pet hates is being squeezed onto a cramped little screen. Indeed, my biggest bugbear with Apple now is their insistence on dropping 17″ laptops from the range; unless they change their minds before this one gives up the ghost, I will have a tough decision ahead. There are a few ‘trick’ CAPTCHA phrases. Good luck with your size issue. I’ve got a Whopper external monitor at my desk. Away from the desk I’m mainly using the laptop to present/demo, on a large external display, or take notes During meetings or, reply to emails. So I don’t need the laptop to have a big built-in display. I value portability in a laptop.